Hartsfield-Jackson Atlanta International Airport (ATL), located just ten miles south of downtown Atlanta, is the world's busiest airport, a title it's held since 1998. The airport averages more than 275,000 passengers daily and 100 million annually and offers non-stop service to more than 150 domestic and 70 international destinations in more than 50 countries. The airport is the hub of Delta Air Lines, which has nearly 1,000 peak-day departures to over 200 destinations worldwide, including non-stop service from Atlanta to 67 international destinations. In fact, Atlanta is within a two-hour flight to 80 percent of the United States population, making it an ideal hub city. The terminal complex, which spans 6.8 million square feet, includes domestic (North and South) and international terminals building and concourses T, A, B, C, D, E and F. Detailed terminal maps are available here. 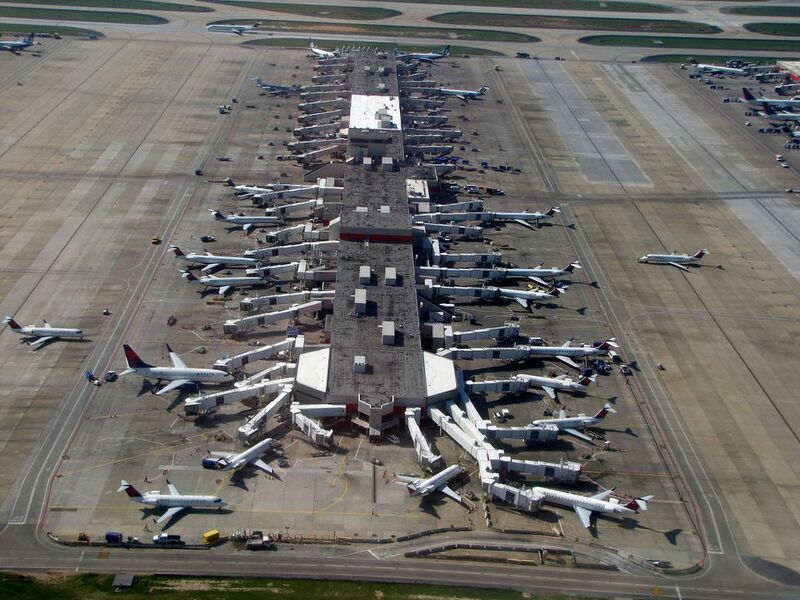 ATL has two main terminals: international (east side) and domestic (west side). The domestic terminal is divided into two parts: south/blue, which serves Delta flights, and north/blue for all other airlines, but the two terminals are united by a central atrium. All terminals are accessible via skywalk and plane train, and travel between domestic and international terminals is available via a shuttle bus. As the airport is the world's busiest and waits at security can reach an hour at peak times, it's recommended you plan to be in line for security at least two hours before your flight. You can get up-to-the-minute security wait lines on the ATL website, which also offers Trak-a-Line, which updates you via email or text if security times significantly change leading up to your flight. Hartsfield-Jackson has more than 30,000 parking spaces, so it is possible to find parking on site, though do check the website for the latest on airport construction projects and road closures that may impact parking options. The domestic terminal has a four level parking deck on the south and north sides offering hourly ($3/hr) and daily ($19/day) parking. Directly adjacent to those decks are economy surface lots with hourly ($3/hr) and daily ($14/day) options as well. Park-Ride lots A & C are slightly cheaper at $10/day and have shuttle service to both terminals. Dining and Shopping: There’s no shortage of things to buy and eat at the Atlanta airport. With more than 263 concession outlets, three duty-free stores and 56 service outlets spanning 230,000 square feet, Hartsfield-Jackson is one of the most convenient airports. Follow this link to learn more about what you'll find inside the airport. Or get a list of the Top 16 Locally-Owned Restaurants at the airport here. Transportation: The Ground Transportation Center is located at the west end of the domestic terminal building and offers shuttle bus services (including to off-site parking and nearby hotels), taxi, limo and sedan services, public transit and bus service, Uber service and more. Follow this link to learn about all of the transportation options. Driving Directions: Basic driving directions and public transportation information. Is the airport off a highway known for its traffic? Story by Kate Parham Kordsmeier, the Atlanta expert for About Travel and author of Atlanta Chef’s Table: Extraordinary Recipes from the Big Peach. Kate can be reached on twitter @KPKords or via email at kpkords@gmail.com. Don't forget to like us on Facebook.